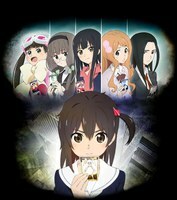 Plot Summary: WIXOSS is a card game that's popular with teenagers. Supposedly there exist "LRIG Cards," female character cards with wills of their own. Special girls can hear the voices of the LRIGs, and those who possess them are called "Selectors." These Selectors have card battles in a dimension that other humans cannot access. It's said that whoever triumphs in these battles will have their wish granted. Ruko Kominato is the latest girl to find a LRIG card. She names hers Tama, and without any further explanation is thrown into her life as a Selector.